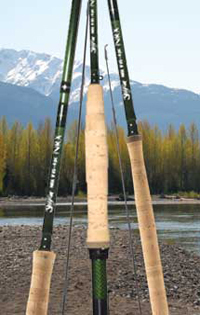 Just when you thought fly rods couldn't get any lighter or more dynamic, along comes a rod that surpasses anything ever made. Thanks to a proprietary, high-tech, nano-silica resin system and the genius of rod designer, Steve Rajeff, these NRX fly rods are the ultimate in extreme performance. They have an unbelievable "strength-to-weight" ratio and can handle everything from tarpon to small trout. NRX is sneaky powerful and smooth throughout the stroke, giving you incredible casting range, line control and accuracy. We understand the fish, the angler and the dynamics involved to make a great fly rod, but it's Steve Rajeff's design genius that makes them some of the best fly rods on the planet.